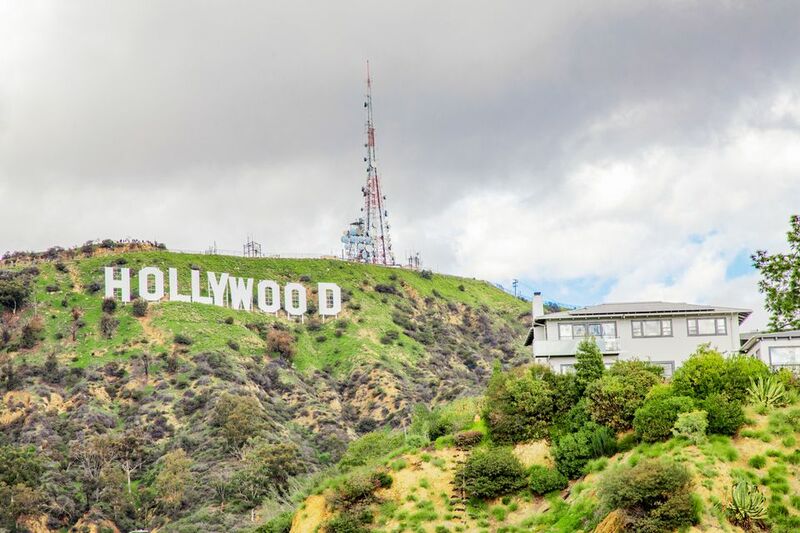 Given LA's starring role in so many movies and TV shows, the city is chock full of famous landmarks that draw visitors from around the world for their personal photo opportunity. These are places that are worth seeing from the outside, even if you never go inside. Some of them are also attractions that you can visit inside, and some are also among the top free things to do in LA but they make this list by virtue of their sightseeing and selfie potential. Looking and taking your own photos is always free. Start with the Hollywood Sign, LA's number one landmark. It is located on Mt. Lee in Griffith Park, but it can be seen for miles around. The Hollywood Sign is the most recognized symbol of LA. The Hollywood Walk of Fame with its terrazzo stars on the sidewalk along Hollywood Boulevard and Vine is another beloved icon that stretches a mile through Hollywood. Crouching down with your favorite star's star is a longstanding tourist tradition in Los Angeles. Although the stars in front of Grauman's Chinese Theatre and Hollywood & Highland get the most attention, there are plenty of interesting stars, old and new, for real people and fictional characters along the entire Walk of Fame. The ornate facade of Grauman's Chinese Theatre and the Forecourt of the Stars where so many great actors have had their hands and footprints immortalized is another must-see Los Angeles landmark. This is a pretty popular destination, included on most Hollywood Tours. Many tours originate here. The Capitol Records Building in Hollywood, built in 1956 to resemble a stack of vinyl 45 records (could equally well be a stack of CDs) is one of the most recognizable structures in the city. The 13-story tower designed by architect Welton Becket is on the Los Angeles Register of Historic Places. At night, the blinking light on top of the tower spells out the word "Hollywood" in Morse code. For Christmas, tree-shaped lights adorn the top of the tower. There's another End of the Trail sign a few blocks north where Santa Monica Boulevard (Route 66) hits the beach, however, whether even that is the real end of Route 66 is disputed. Some historians claim that Route 66 actually ended about 10 blocks away from where Santa Monica Boulevard (Route 66) meets Lincoln Ave (Highway 1) because an official designated highway had to end at another official designated highway. For a highway that was originally 2448 miles long, what're a few extra blocks? It certainly doesn't deter visitors from grabbing selfies with the sign on the pier. The Walt Disney Concert Hall in Downtown Los Angeles is Frank Gehry's ship of stainless steel waves sailing down Grand Avenue at the corner of 2nd Street. Since it opened in 2003, the building has become one of LA's most recognizable and most photographed landmarks. There are audio tours available, and you can climb around and explore the building on your own. The entrance faces northeast, so mid-summer mornings or twilight after the sun has set are the most photogenic times to shoot the entrance and not have it be too much in shadow, but the building is photogenic from other angles. This view is from the southeast facing north. Hidden behind the steel curve near where the people are walking is a stairway that goes up on top of the building for some more cool photo opportunities. Griffith Observatory in Griffith Park overlooking Downtown Los Angeles is worth a visit to see the views of the city and the Hollywood Sign, as well as the Observatory itself. There is a museum inside the Observatory, and of course, the entire sky overhead to observe from various telescopes, but the building and the views are worth the drive, even if you don't have time to do more. All the major Disneyland landmarks are inside the parks, but at Universal Studios Hollywood, the iconic spinning golden globe is outside the gates where anyone can enjoy a photo opportunity. For those on a budget, there's even a free shuttle from the Metro station that will take you right there. There has been a giant guitar in front of the Hard Rock Cafe on Universal CityWalk since it opened in 1996 and that is the visual that's etched in most people's memories from various TV and movie appearances or past visits. In 2011, that guitar got a new paint job when the 5 Towers outdoor stage area was added on CityWalk next to the restaurant. The current design is a replica of Eddie Van Halen's Frankenstrat. It costs money to see a concert at the Hollywood Bowl, but it's free to stop by during the day when there's nothing going on and check out this famous outdoor band shell. The Hollywood Bowl Museum is free and if you time it right, you might catch a bit of the LA Philharmonic rehearsing in summer. The Hollywood Bowl is a stop on the Starline Hop On Hop Off bus tour. The Theme Building, which used to house the Encounter Restaurant and still has an observation deck open on weekend, is instantly recognizable as Los Angeles International Airport. It looks like something from the 1960s space-age cartoon, The Jetsons. The regal ocean liner The Queen Mary hotel and attraction, and the neighboring Dome, which houses the Long Beach Cruise Terminal, instantly identify the location as Long Beach, the southernmost city in LA County. LA Union Station, the "​Last Great American Train Station," is another historic icon, seen in dozens of movies representing Los Angeles on the outside and train stations around the world on the inside. Not quite as recognizable to non-locals as some of the city's more famous landmarks, the modern Cathedral of Our Lady of the Angeles towers over the 101 Freeway in Downtown Los Angeles across from the Los Angeles Music Center and Chinatown. Watts Towers seems to be better known by international visitors than by many Americans, but a selfie by this landmark in South Los Angeles will tell your friends that you got off the beaten path and tried out some of the alternative things to do in LA.